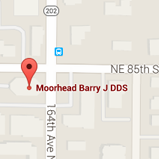 The Redmond, WA dental office of Barry J. Moorhead, DDS, PS embraces traditional values and ideals, while offering our patients services that reflect the latest technological advances in oral healthcare. We aim to offer a comfortable, inviting office environment and encourage open communication between our patients and our staff. In our practice, we recognize that communication is the foundation to creating enduring relationships. Dr. Moorhead and our team focus on preventive dentistry. By teaching our patients how to care for and maintain their healthy smiles, we ensure that their oral healthcare remains sound for years to come. Our Redmond general dental practice is conveniently located on the corner of NE 85th Street and 164th Avenue NE in Downtown Redmond, Washington. Call us to schedule an appointment today!